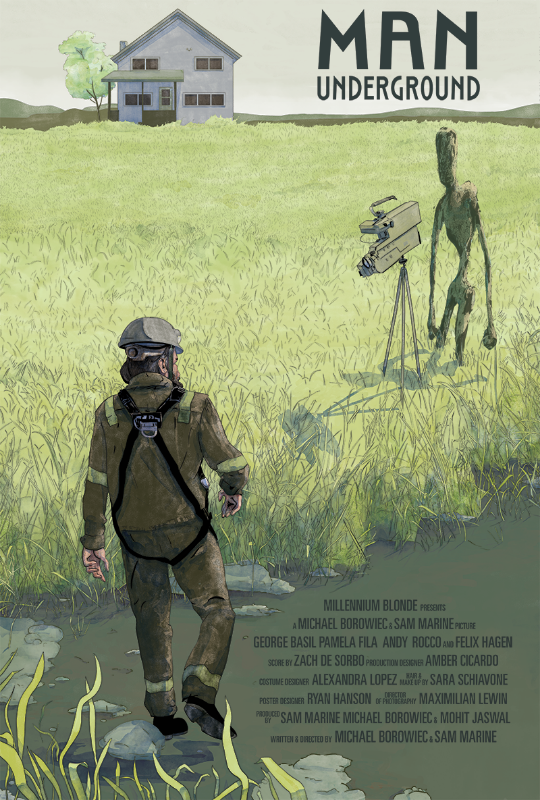 Willem Koda (George Basil) is consumed with a desire to expose the truth about aliens and the government conspiracy to shelter us from that truth. As a geologist who was once employed by the government Willem saw something first hand that changed him. With no regard to the personal cost, he will forfeit his career and family in pursuit of this quest. In a summer that has brought you INDEPENDENCE DAY:RESURGENCE, STAR TREK:BEYOND and other space movies with a colon in the title, you probably already have a vision of what MAN UNDERGROUND might be... trust me, you're wrong. If the film were titled MAN:UNDERGROUND any preconceived notions you have would probably be correct, but fortunately, first time filmmakers Michael Borowiec and Sam Marine had something far more personal in mind when they made this film. Willem has one friend, a YouTube channel that gets hundreds of hits and his favorite diner. It's a fairly simple little life he has carved out for himself. The film opens with Willem giving a lecture on alien conspiracy to a near empty room. The scene isn't played for laughs or to build tension, it displays a human side of our protagonist that is utterly disarming. Chances are you don't know anyone like this in your personal life, but maybe you met him at a party or sat next to him on a bus. You were probably dismissive (either outwardly or inwardly), but when you see him in this light it is hard not to feel empathy for this deeply flawed man. The momentum of the story is pushed along when Willem goes to his diner and hits it off with the new waitress Flossie (Pamela Fila). She is as open as he is guarded. This isn't a typical romantic comedy encounter, where two lives intersect and hilarity/romance ensues. This is the kind of story where two people who desperately need someone to listen find a non-judgemental ear in one another. Its readily apparent Willem needs someone he can talk to, he fills the frame with quite desperation. The decision to make a film about his life serves as a way to get his message out to the world, but more importantly it's an excuse to spend time with Flossie. This autobiographical film starts out somewhat silly. Willem is flat out terrible at portraying himself, but as time goes on he becomes more comfortable in front of the camera and we gain insight to why he is the way he is. It is a brilliant way of slowly and organically unveiling a character and in no way feels clunky or forced. I'm not sure if audiences will appreciate how difficult bad acting is to pull off. The actor has to be present as the character who is uncomfortable but trying to play natural, while doing the same thing himself. It's like a snake eating its own tail. Basil does this beautifully, and gives a layered and nuanced performance that carries the film. This is ostensibly a science fiction film but it's really a character piece. It is a film driven by human interaction instead of special effects. Currently MAN UNDERGROUND is playing festivals around the world and if you would like to get more information go to the filmmakers website and sign up for the mailing list.